I dropped in to the Station this morning with the intention of cutting the grass – but it was too wet from last night’s rain. So I started working for the GWSR team – Gloucestershire & Warwickshire Stump Removal team that is! 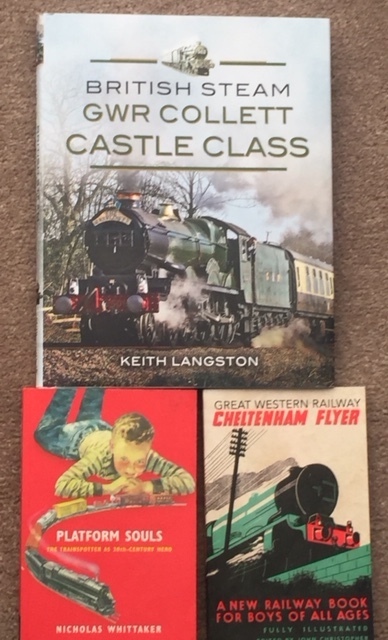 However, I have a feeling that readers may becoming too bored with this activity, in a blog which is supposedly about trains, so I will save you the usual groans – just the pictures. It was so big the hole is now GWSR’s only tiger trap! Meanwhile, at an otherwise deserted station, I had 2 visitors. The first was a gent who wanted – amazingly – a carrier bag full of pine cones (I kid you not!). So I very happily helped him without needing to stray more than 10 yards from the station entrance. The second visitor was a driver experience train which hove into view at about 1000hrs – with more coaches than people on board! However, they all seemed to be thoroughly enjoying themselves. Being unable to face further hard labour I retired to the Klargester Pit – a nice quiet location – and removed the rampant weeds. The old Klargester is one of our unsung heroes at the railway – it gurgles away 24/7 and off goes all the effluent without any drama. In return for which it now has a nice clean pit. And finally, Gloucestershire’s finest highway repair men were in evidence behind the Ticket Office – working on the Malvern Road bridge and executing, I suspect, one of their famous repairs to the largeish holes in the road surface. We’ll just make a note in our diaries and see how long it lasts! 4 Jun – On Platform 2 where the poppies grow! Pine Cones! A source of income!